In my neck of the woods, it seems as if Greece is attempting to become the new Spain. There are now a bevvy of inexpensive Greek whites and reds available in the local wine shop. Some are great finds like - Robola, Xinomavro and Santorini (named for the island of origin. Santorini is made from Asyrtio). My favorite Greek grape name to date is Roditis. 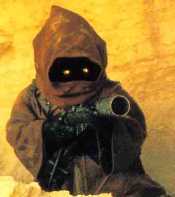 I was drawn to it as the name reminded me of the sounds of Jawas celebrating the short-circuiting of R2D2 (admit it, you know exactly what I'm talking about. Listen here). Sadly, my first taste of Roditis wasn't fantastic. I will however, try it again, if only so I can say, "Roditis!" It's sad that Merlot's reputation as a varietal has been sullied by waves of under-whelming wine. How often do you hear someone (who fancies themselves a wine lover) order a bottle of Merlot? Last week at a lovely little restaurant in Santa Barbara, I ordered a glass of Westerly Merlot '03 to try with lamb. The wine was not at all soft and fruity. Rather, it was a little herby and a little edgy - perfect with roasted meat. My new mantra: "Don't hate the grape, hate the winemaker's hand." Speaking of my new mantra (and I don't hate, the word 'hate' just fits better in the mantra. Let's call it 'dislike'. ), while in Cali, I had the opportunity to taste two wines from the very same vineyards, but made by different hands. One a Sangiovese by Bruno, the other, a Sangiovese by [name redacted]. Bruno was as complicated and lovely a red wine as one could ever want. On the other hand, the [redacted] Sangiovese was an over-opulent, droopy ball of fruit and alcohol. It seems the major difference in the two was the winemakers. Some get it. some don't. Amongst my favorite vinous gifts from the Greeks is Santorini. It's a fine, crisp & unique white wine. Until now, I have avoided, perhaps subconsciously, the other well-known Greek white called Robola. It's name hearkened to another '-bola'-suffixed word, which is at the very least unappetizing. 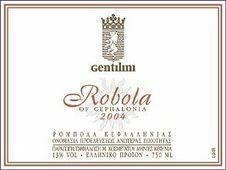 When its entire name, "Robola of Cephalonia," is taken into consideration, the wine seems much more appealing. A great springtime wine and perfect with grilled chicken or kabobs. This wine is fairly rare, so if you find it, pounce on a bottle or two. It's no terribly common these days to find value-priced wine that is truly unique. Clear, pale lemon core fading to a pale watery rim. Clean, medium-intense, youthful nose of creamy pear, citrus, and a zingy, floral note. No oak detectable. Dry, with crisp acidity, full body, and an intense palate of spicy citrus, creamy pear and minerals. Medium alcohol with medium-long length. A fresh, very good quality wine made from the Robola grape on the island of Cephalonia (Greece). Drink now and over the next 3 years. Friday. Brought to you by the letter R; as in Retsina. R - Retsina. Are you a brave soul? Then close your eyes and take a sip of this Greek wine. It’s been around for over 2700 years. Retsina is a white wine that has been infused with pine resin. It packs quite a unique flavor-punch. Some might say it is an acquired taste like, oh, pine needles. See if you are able to train your tongue to like Boutari Retsina ($8). It's WineBloggingWednesday and this week that means, "Obscure Red Varietals." Xinomavro (pronounced Ksee no' ma vro) is a red wine grape from the northern Greek region of Macedonia. It's name means, "acid-black." And if that doesn't get your mouth watering, I don't know what will!? Boutari is one of Greece's largest, if not the largest, wine-making group. Boutari makes a fine white wine called, Santorini. But since today is for obscure reds, I grabbed a bottle of Boutari's Naoussa, '02 ($13). Like most Old world wines, Naoussa is named for the region rather than the grape. Greeks call this an, "Appellation of Origin of High Quality." And this brings us back to Xinomavro - the red grape used in red wines from Naoussa. To conclude, let me state for the record, "A varietal name that begins with an 'X' and contains four syllables, should definitely qualify as an obscure red." Believe it or not, this wine was tasty by itself, but was obstinate when it came to food pairing. I imagine it could handle grilled chicken or something of the like. Think of it as a simple Beaujolais minus the brambly quality. The institution that is WineBloggingWednesday is coming this week. The theme is obscure red grape varieties. In honor of WBW, all the wines I'll review here this week will be of the 'odd' variety. First up - Santorini. Santorini, takes its name from the hilly Greek island (also known as Thira) sitting on the rim of an ancient volcano. The grape variety used in this wine is the ancient, Asyrtiko - a Mediterranean white grape that can produce wines with crisp acidity under the intense sun & heat of the Greek Isles.